Custom designed North Andover Early Childcare Center Massachusetts is the new building for the Franklin “CUBS” preschool, named for Children United by Special Abilities. The new 13,000 square foot home of the CUBS school opened for tours in mid-June and opened to students for the 2009 school year. 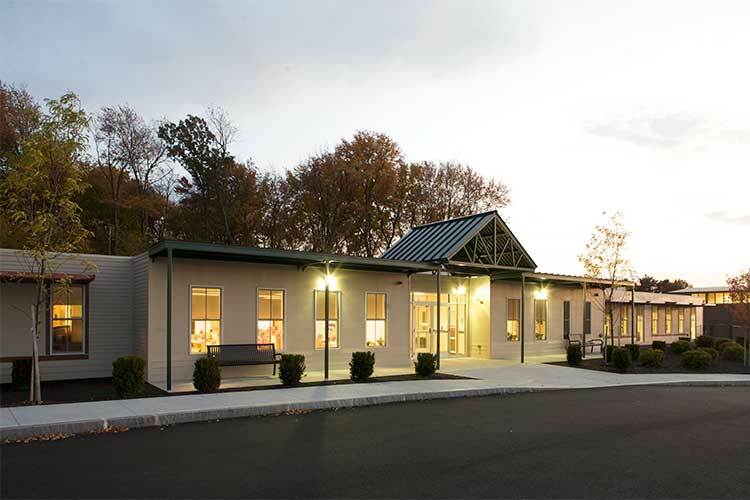 With the efficiency and time savings afforded by modular construction, the total time from conception to completion of the school was only six months. Triumph worked with the Franklin School to create a customized space with their specific design requirements, such as 10-inch toilets and sustainable features such as white roofing, energy recovery ventilators, and microbial (mold resistant) drywall to give the students an optimal learning environment. This project is further proof that the accelerated project delivery method afforded by building modular is of the highest quality and a permanent solution to building schools and additions. Children deserve the absolute best, and Triumph is thrilled to be able to provide a healthy new space where students can learn and thrive for many years to come.